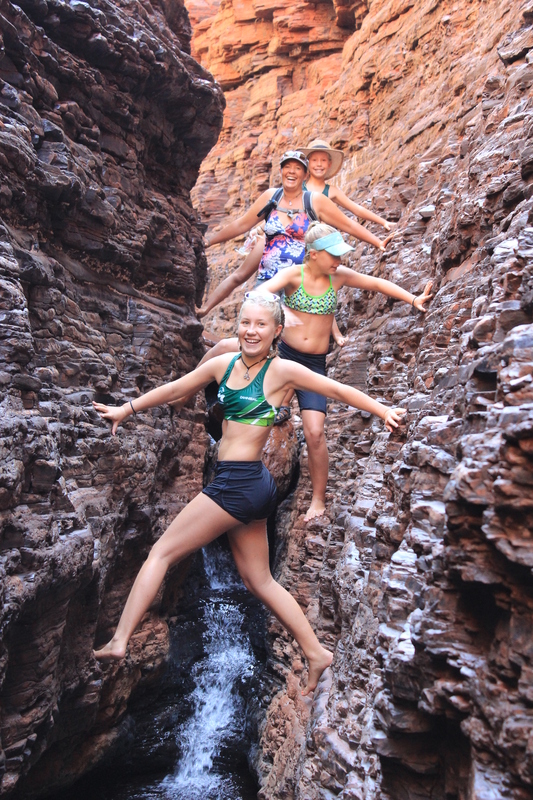 Karijini National Park had always been on our wishlist, we have seen so many photos and in the last 12 months have heard so many fantastic reviews that there was no doubt that we would make a bee line straight for it. 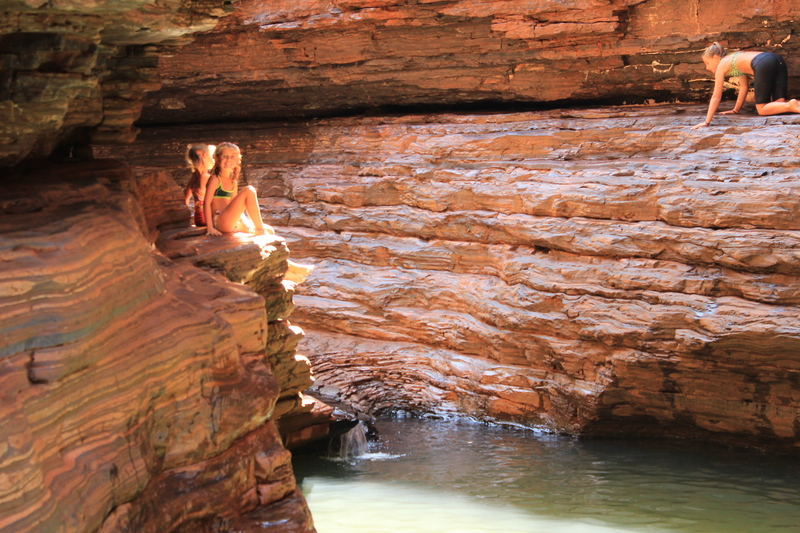 Our stay here coincided with 2 things, firstly the WA school holidays and secondly the annual ‘Karijini Experience’. It had crossed our mind that with both of these things occuring at once, that the park may be a bit busy, so we were slightly concerned about getting a campsite in the national park, as it was first in first served, no bookings taken. 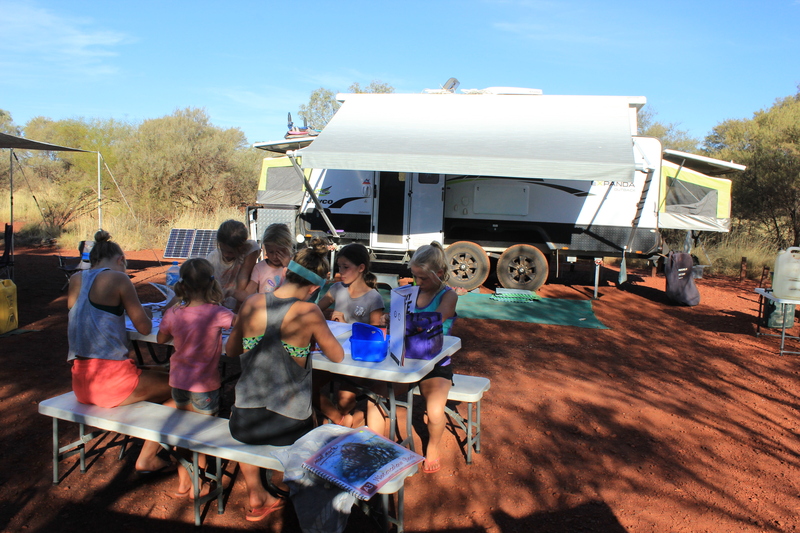 However, before we left Paraburdoo we rang the visitor centre and she told us they have heaps of spots available, which was a relief. 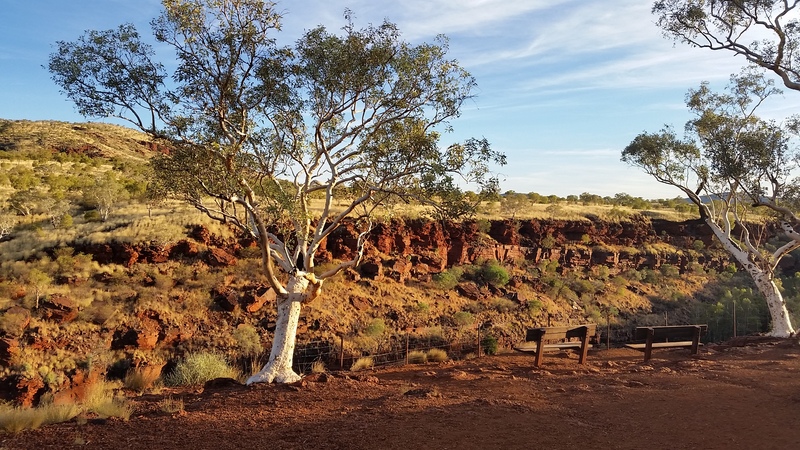 Karijini National Park is WA’s second largest national park, located within the Hammersley Ranges, in the heart of the Pilbara, it’s landscape is quite amazing with huge mountains and deep gorges that cut through the flat valleys. 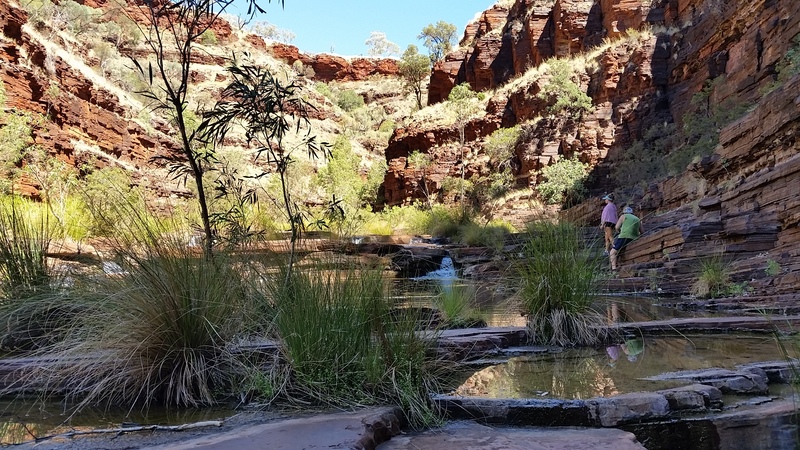 We were not sure what to expect from Karijini, however going by everyones feedback we had a feeling we wouldn’t be disappointed. 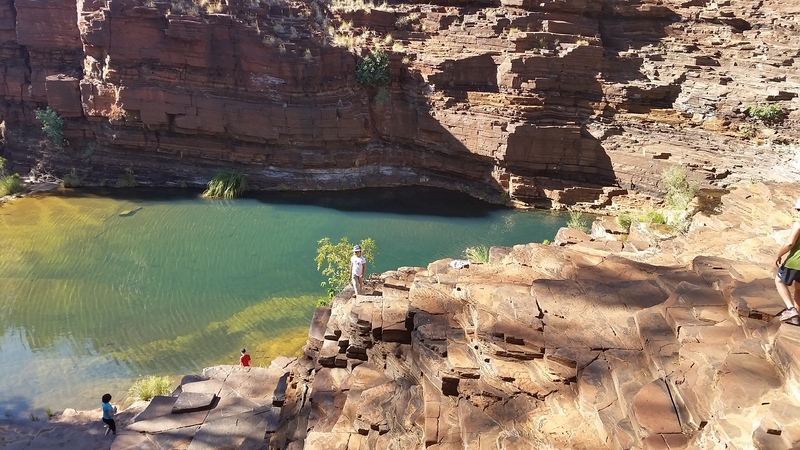 We had decided to stay within the Dales Recreation Area, which was located on the eastern side of the park close to the visitors centre, not far from all the spectacular gorges. 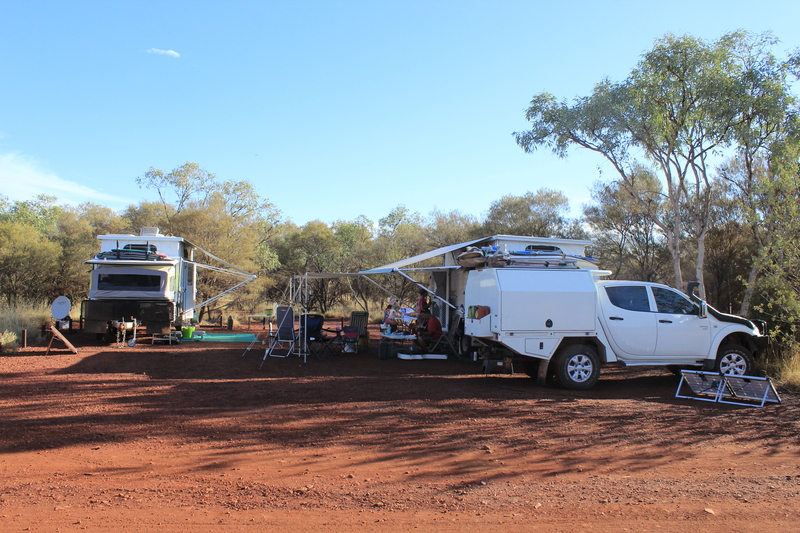 It was a national park campsite with no power and basic facilities, however reasonably priced. 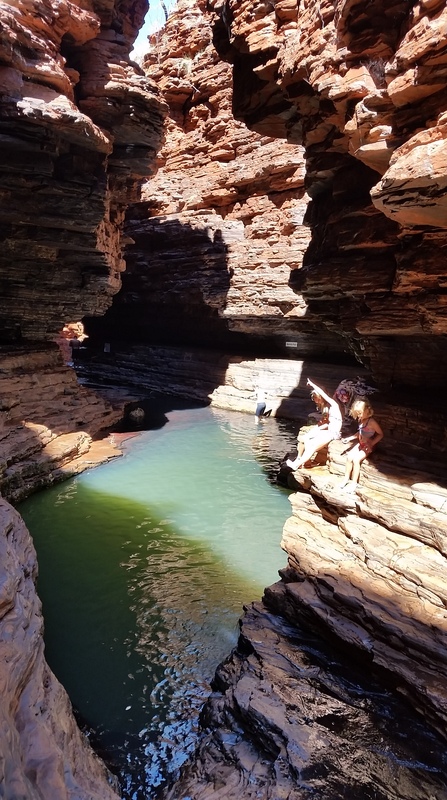 We booked in for 6 nights to allow ourselves plenty of time explore the many gorges and particpate in a few of the free events for the Karijini Experience. Our camp set up at Dales campground. The girls doing art classes. 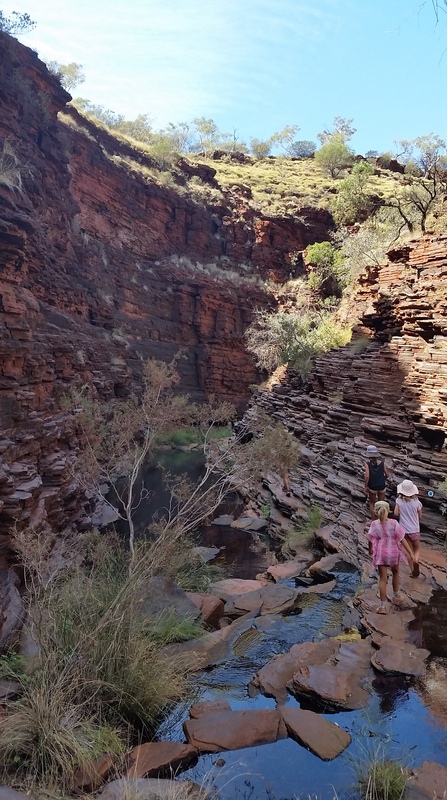 A short walk from our campground was Dales Gorge, where we spent many days exploring. 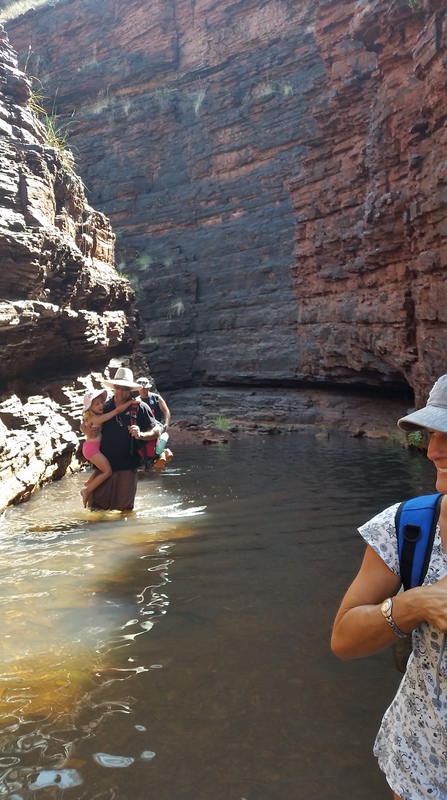 Our first adventure and swim was at Fern Pool. 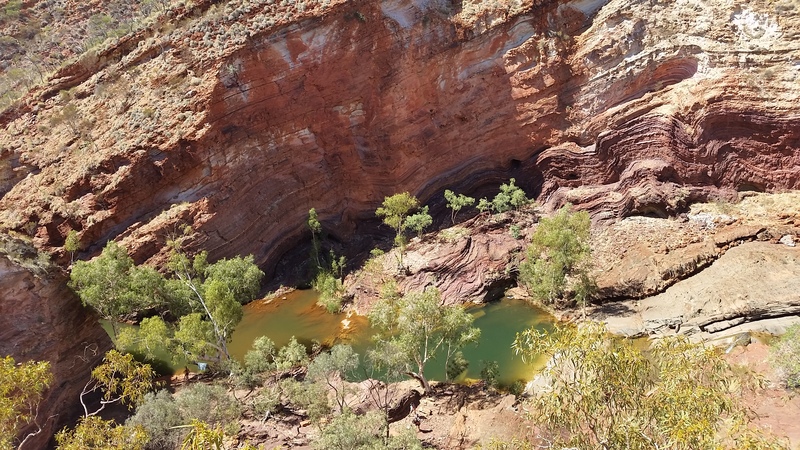 The scenery was breathtaking, one minute your walking along the path from the car park and the next minute your staring over the cliff into a huge gorge, the colors were mind blowing as the gorge is lined with white Sappy gums against the reddest of rock. The rock is actually made up of mostly iron and silica-rich sendiments compressed into the earth many millions of years ago. 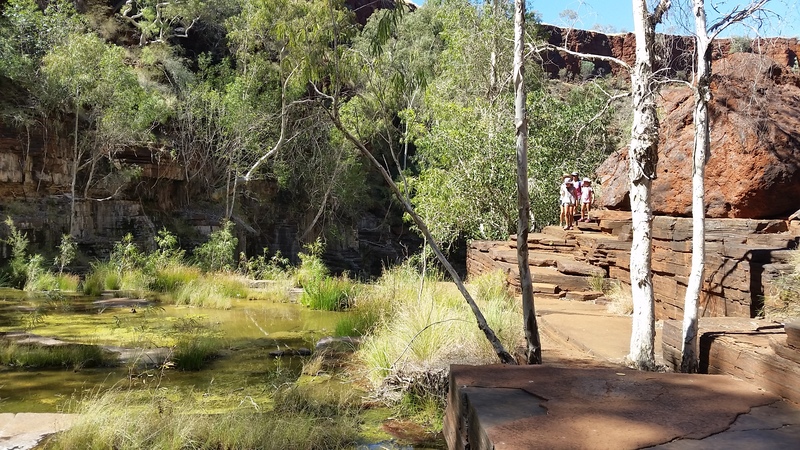 During our time there we were lucky enough to make the ranger walk and talk, as well which gave us a bit more insight into the gorge and Fern Pool. 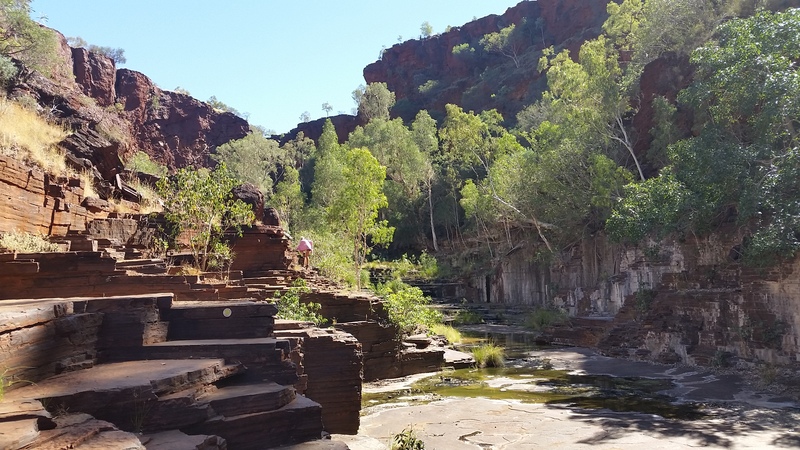 Apparently, according to the traditional Aboriginal stories, Fern Pool is a bottomless pool and is a significant cultural site for the traditional land owners. 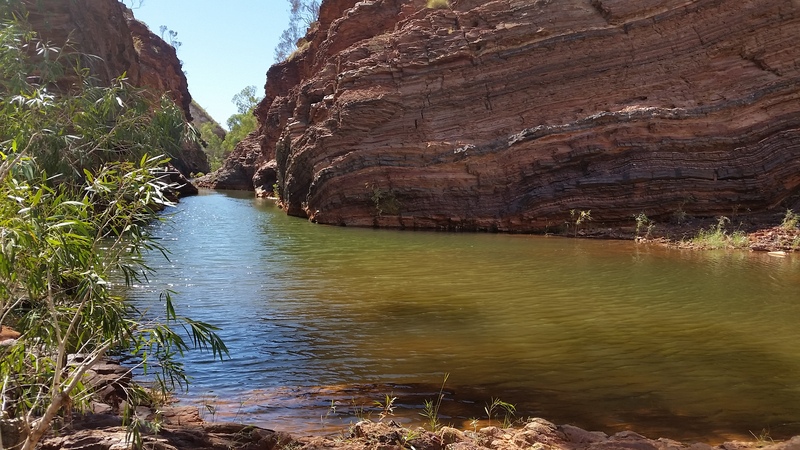 According to the dreamtime a serpent lives down below the water, therefore everyone must pay their respects to it as they enter the pool. 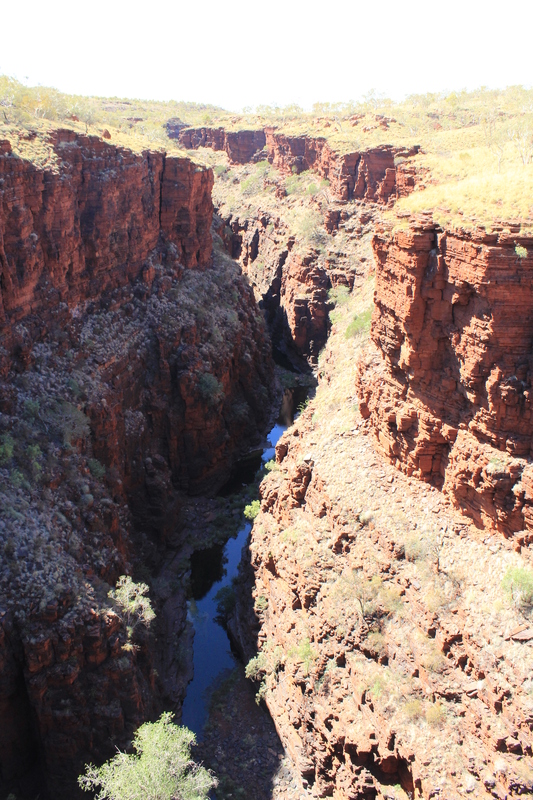 The edge of the gorge. 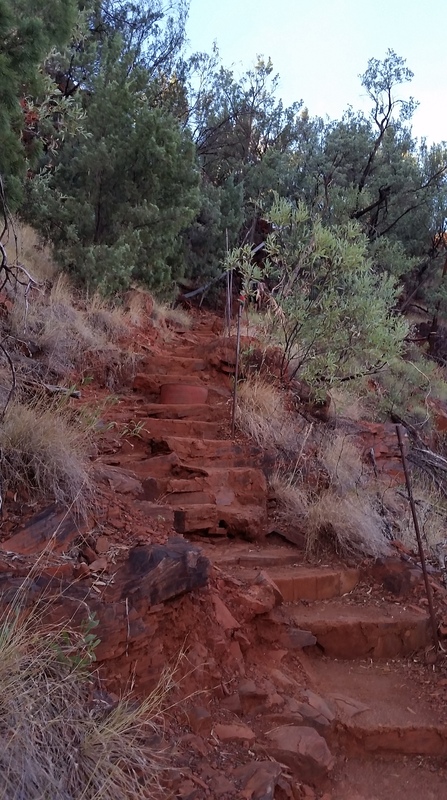 The track down into the gorge. 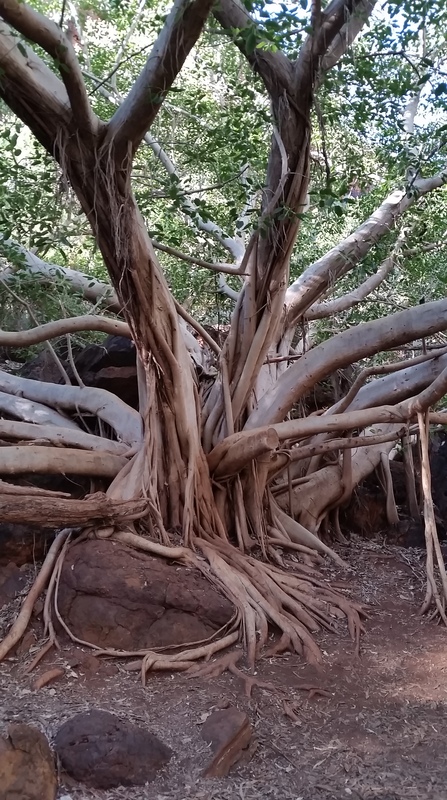 A massive Common Rock Fig on the way to Fern Pool. 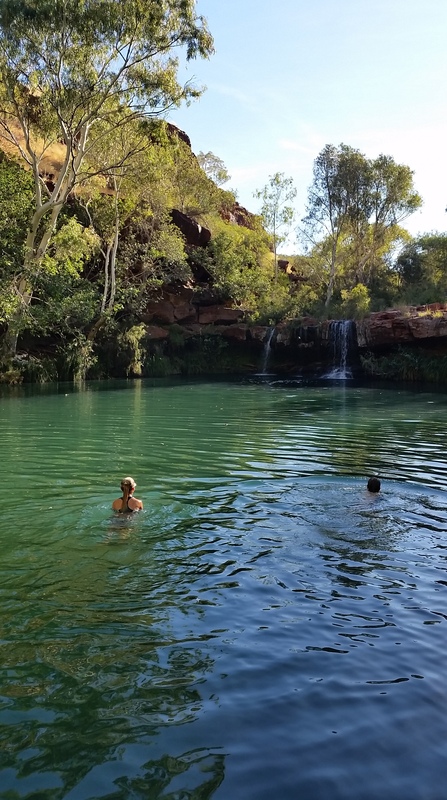 Swimming over to the waterfall in Fern Pool. Under the waterfall at Fern Pool. 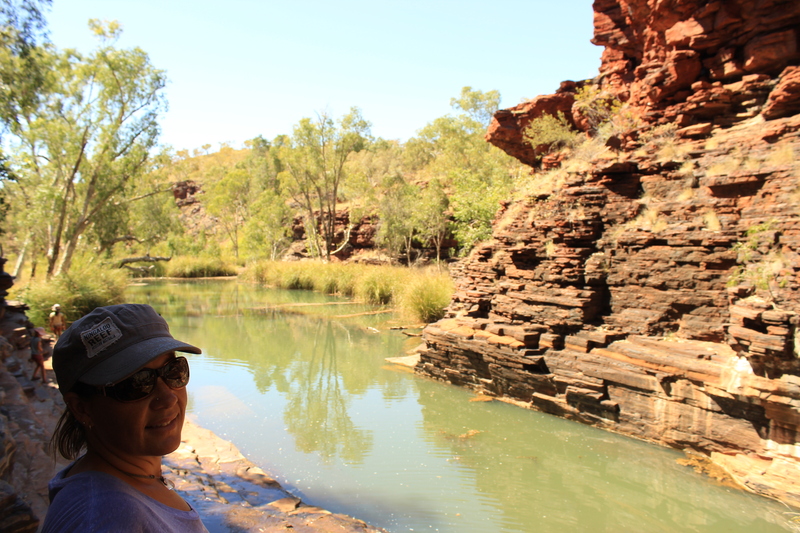 Also at Dales gorge, we hiked down to Circular Pool, another significant Indigenous cultural site. Circular Pool was magnificant, aside from the other 100 tourists that were there, it had a peaceful, spiritual aura about it. Nik and the girls paid their respects before they went for a swim, however as the water was coolish (read FREEZING), I went and found a quiet ledge on the rocks away from the bustling crowd, to sit and admire the beauty and feel of this special place. I could only imagine how special it would have been to be the only person there. Sitting there watching the fresh water trickle out of the rock, creating a waterfall into the pools, made me feel very lucky. 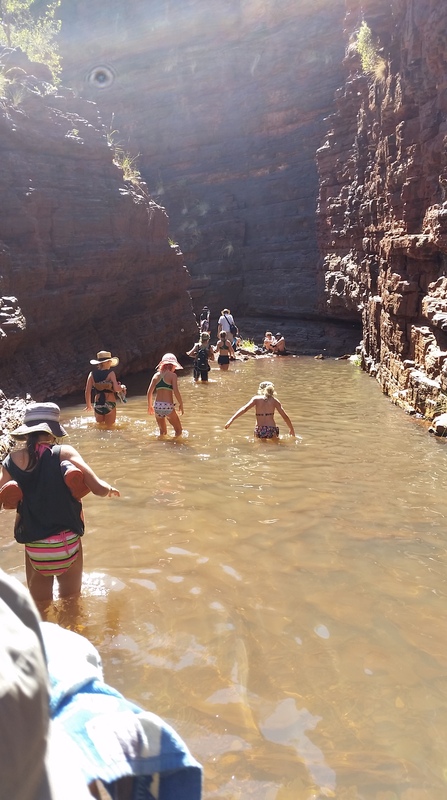 The hike into Circular Pool. 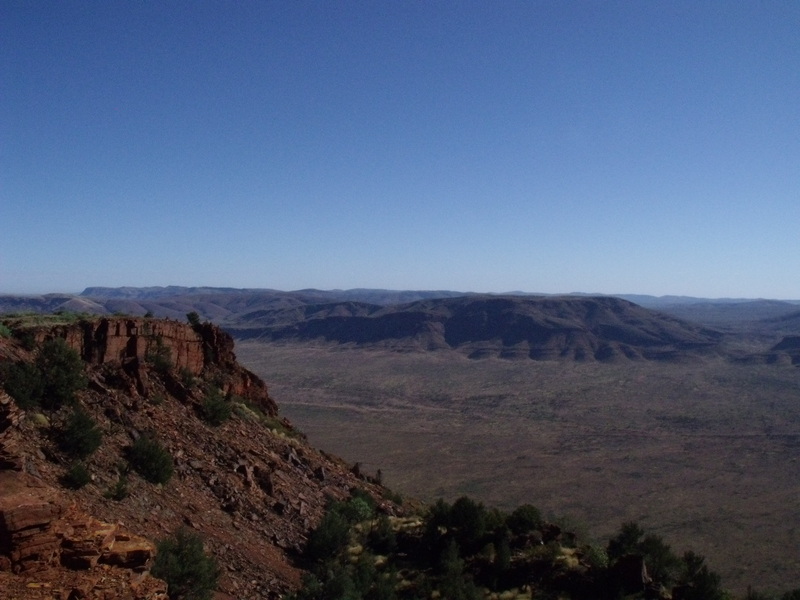 The surrounding red rock cliffs. Thinking about jumping into the freezing water. Sitting afar watching the water seep out of the rocks. 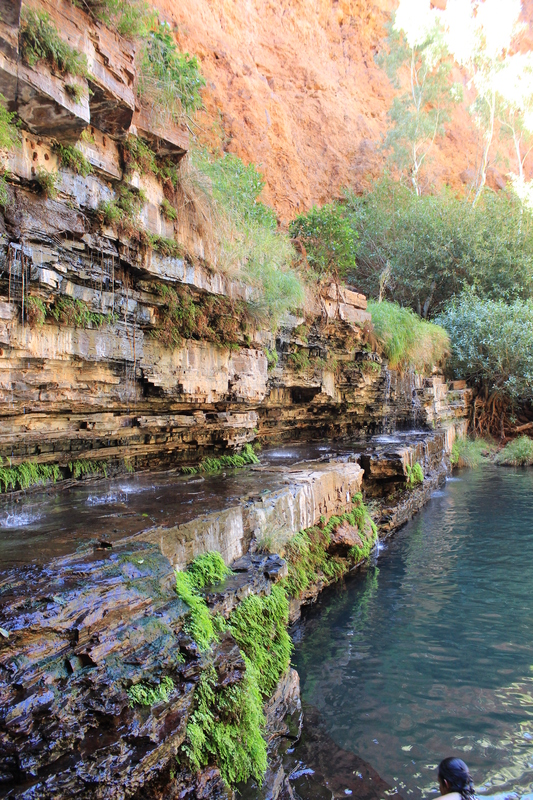 The water seeping through the rocks into Circular Pool. 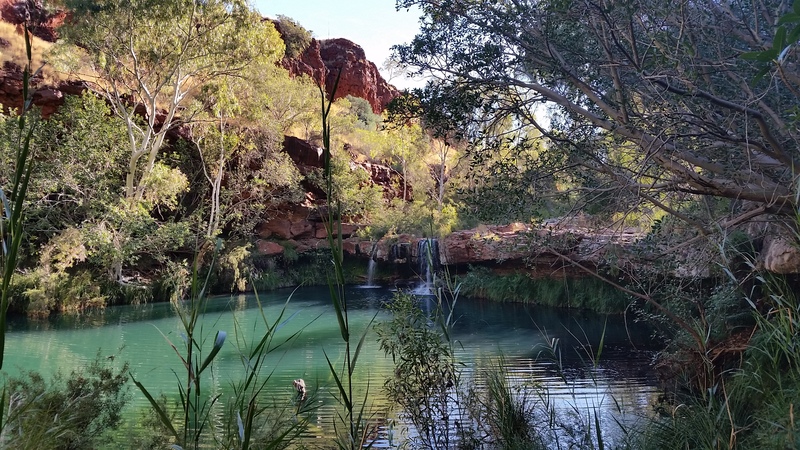 From Circular Pool we hiked along the river, scrambling over rocks and through the river, finishing up at Fortescue Falls. 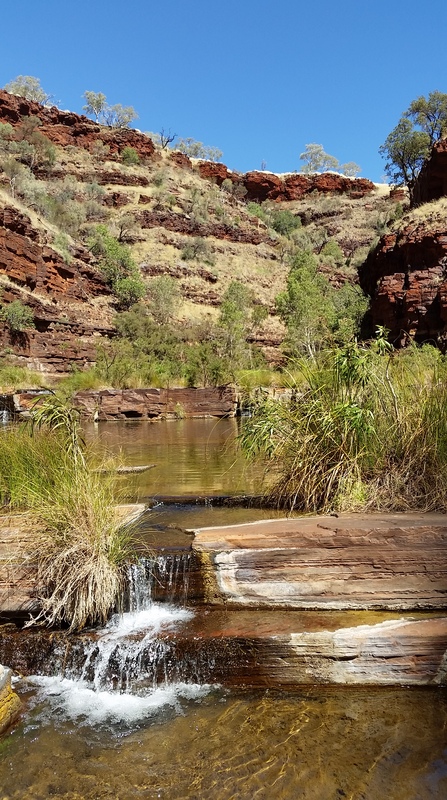 Fortescue Falls is a beautiful waterfall just downstream from Fern Pool, with the surrounding rocks of the falls creating a natural amphitheatre. 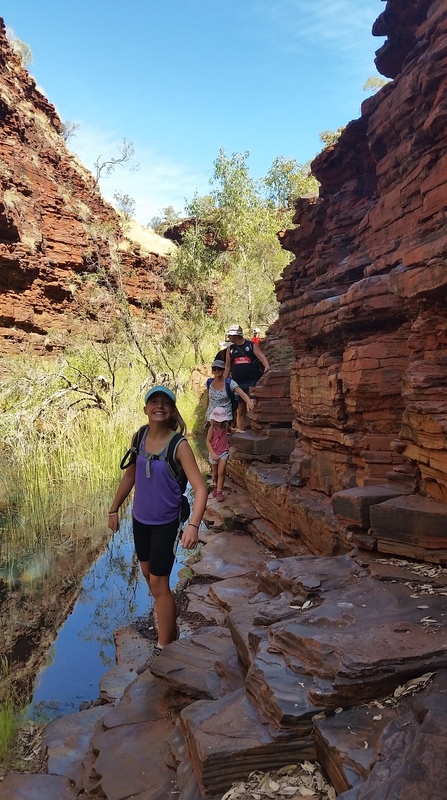 As the weather was still very hot and we had hiked 2km from Circular Pool, we finished off the walk with a relaxing swim before we tackled the tough stairs back up to the carpark. 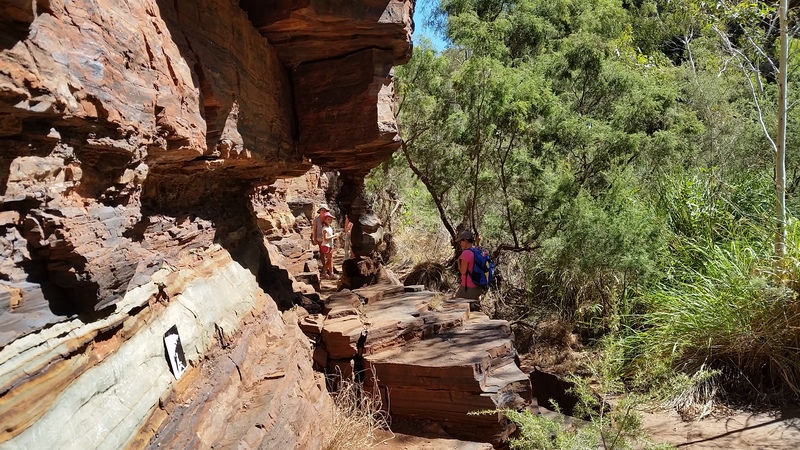 The walk from Circular Pool to Fortesque Falls. 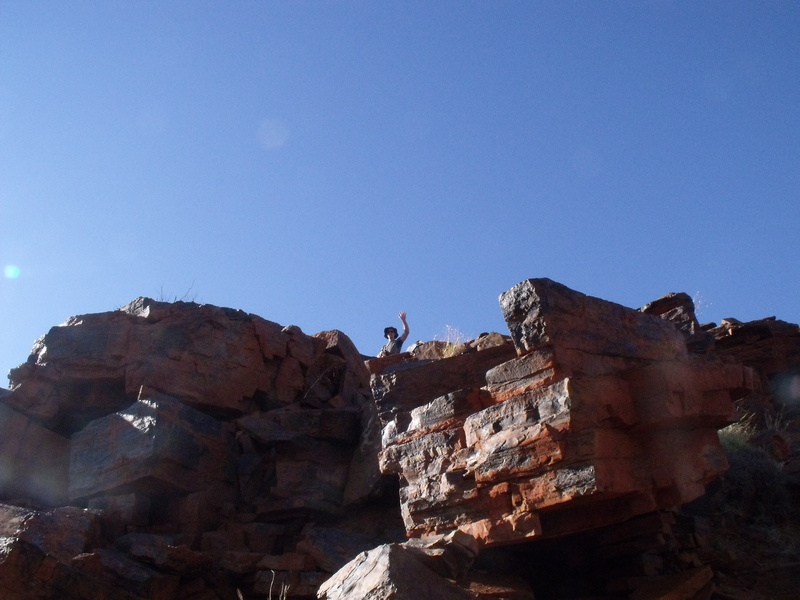 Was a fun hike over rocks and through water. On our way to Fortesque Falls. 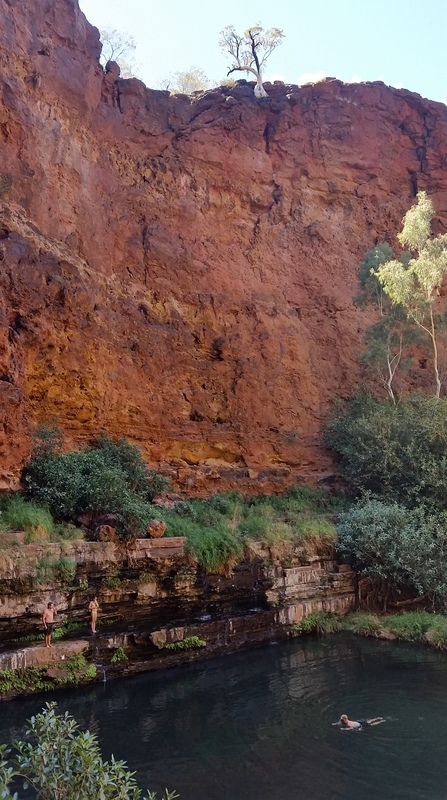 The pool at Fortesque Falls. 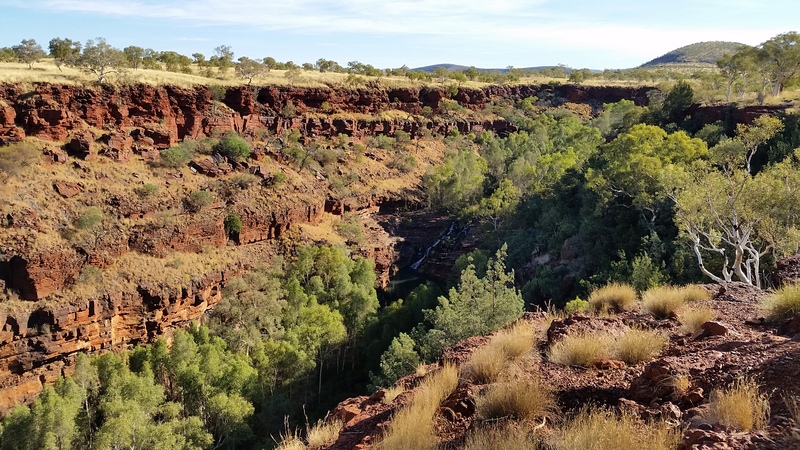 A little bit further from our campsite, were both Weano and Hancock Gorge, however due to having a poor wet season the ranger advised against going into Weano Gorge and the hand rail pool as the water was stagnant and not nice to swim in. 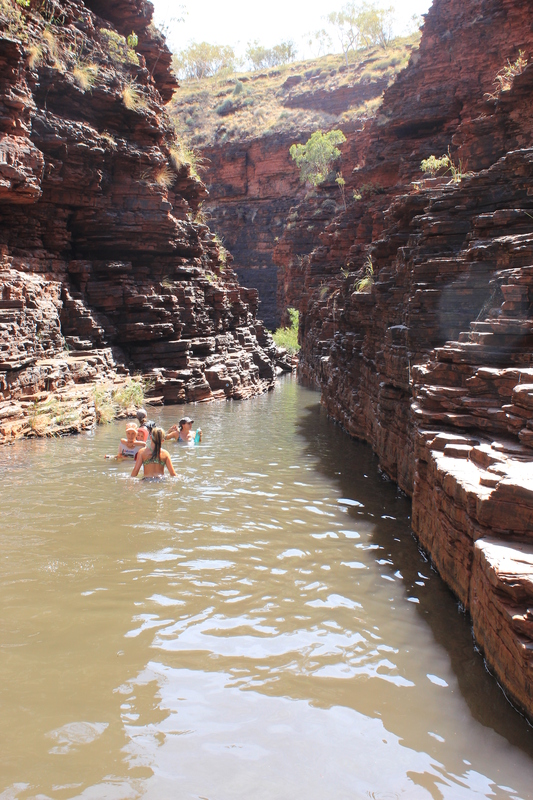 Hancock Gorge however, was a different story, so we headed down into the gorge, swimming through the ‘sheep dip’ into the ‘Amphitheatre’ and then continuing along the ‘spider walk’ into the Kermits Pool. 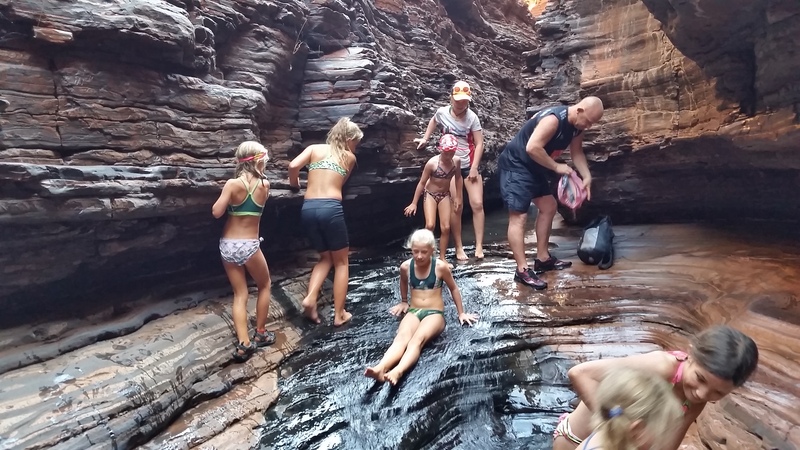 Kermits Pool was definately voted our most favourite part of Karijini, so much so that we tackled the obstacles again for a second visit before we left. I think one of the reasons we like this place so much was that it was never really overcrowded, so we could feel that we could sit and relax and take in the surroundings in peace. The hike down into Hancock Gorge. Little people needed a helping hand. This was the shallow bit of the sheep dip. 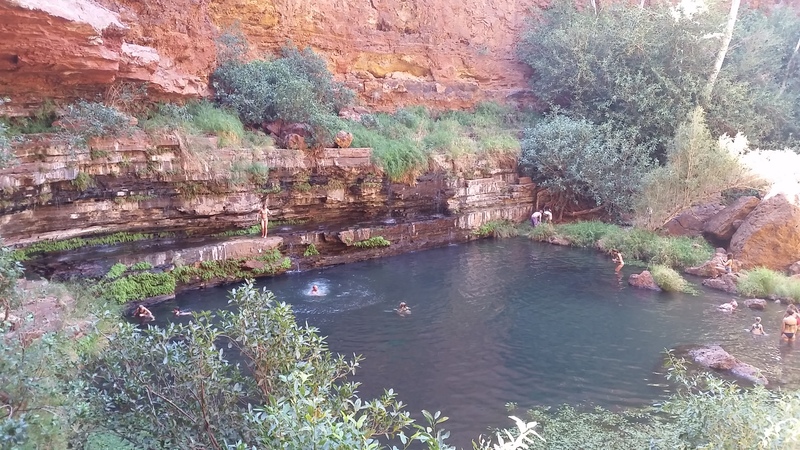 The sheep dip on the way to Kermits Pool. Resting in the Amphitheatre before moving on. 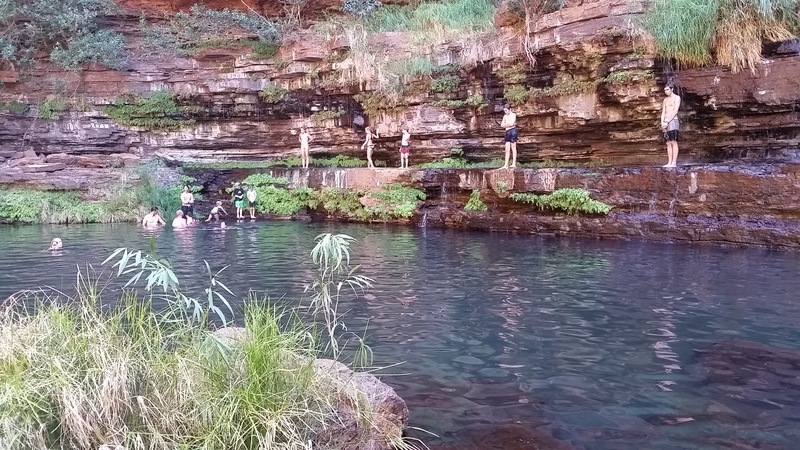 Having fun at Kermit Pool. 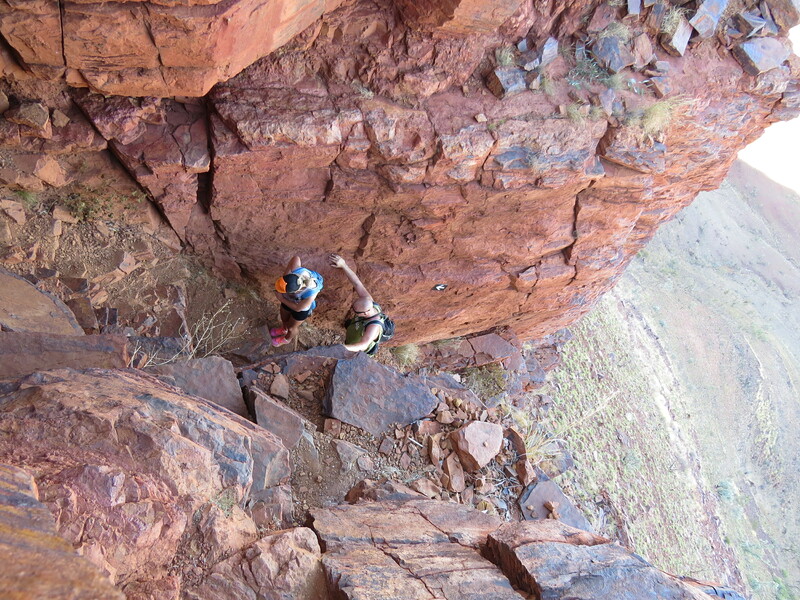 Sliding down the last bit towards Kermits Pool, it was much safer on your bottom. 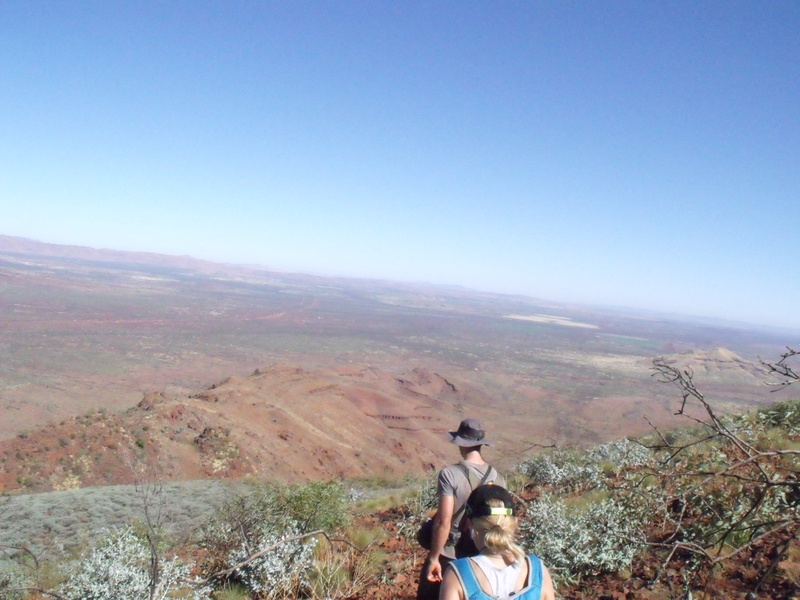 We also went and had a look at the lookouts for Joffre and Knox Gorges and whilst we didn’t hike down into the gorges the views were again spectacular. 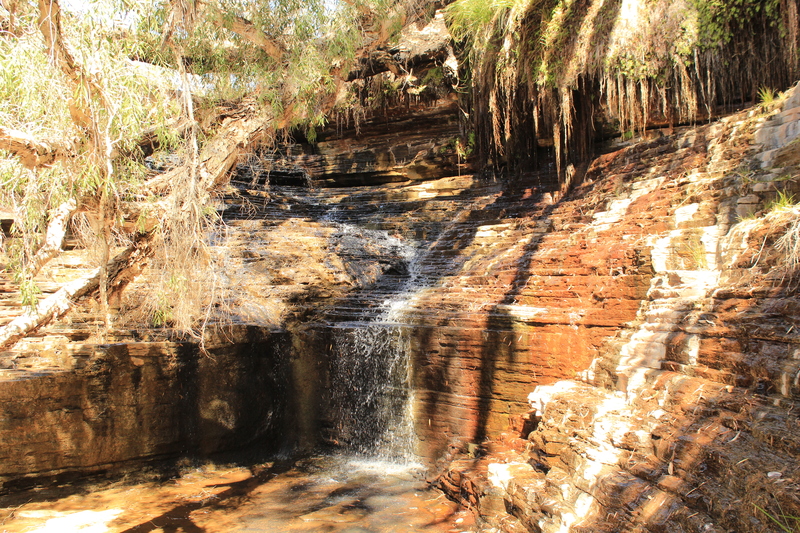 Yet another gorgeous waterfall for somewhere so arid. 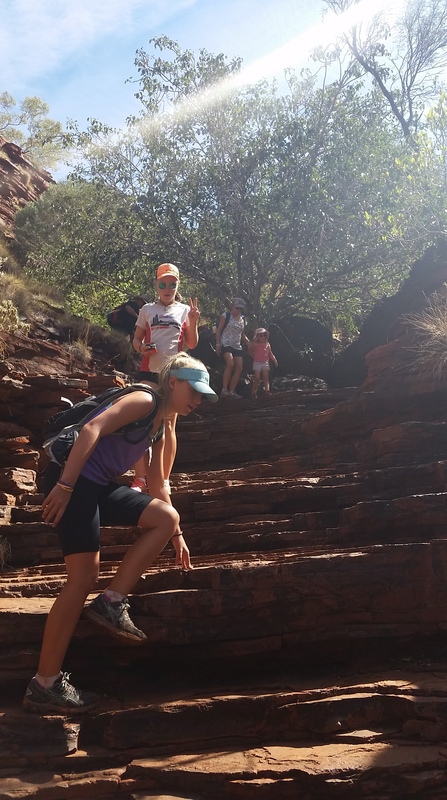 The climb up Mt Bruce. 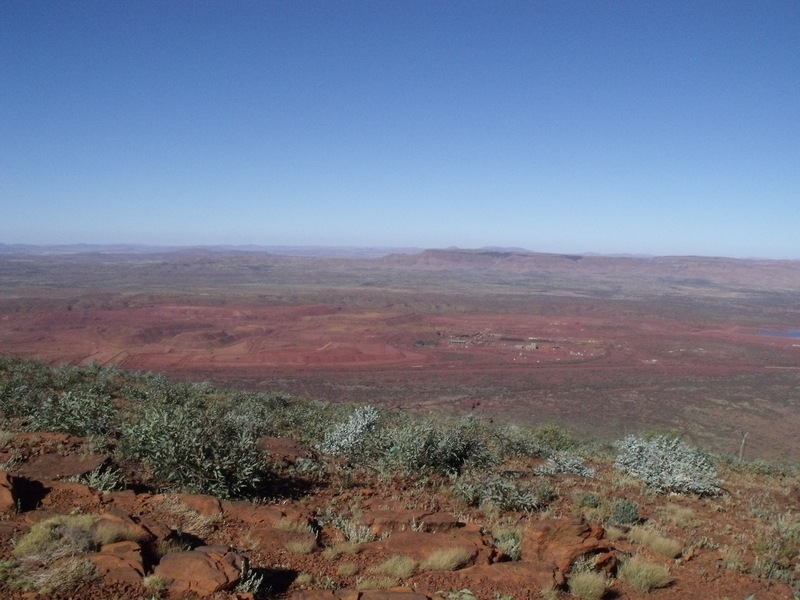 Views of the national park. 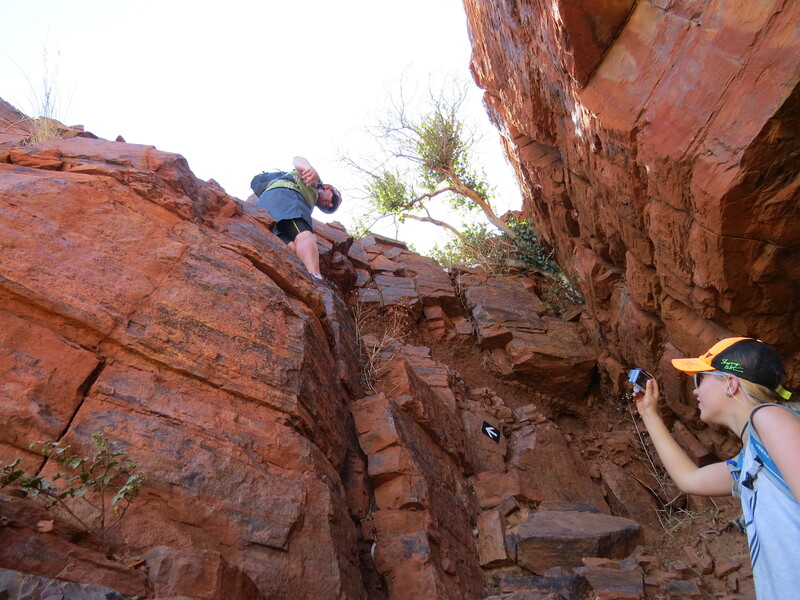 Simon climbed up first then took a photo of Nik and Bec following…..
Whilst Nik, Bec and Simon went for their stroll, Fiona (our other travelling family buddy) and I made the long trek into Tom Price to run a few errands. Firstly we needed food, we were running quite low and were in desperate need for some fruit and vegetables. Unfortunately, after dropping Bec and Nik at Mt Bruce at 7am we were a bit early for Coles, so we took one for the team and sat in a cafe and had bacon, eggs and a coffee…… Even when Coles opened they hardly had any stock, as they were still waiting on the load from Perth, whose flight was delayed, so we ditched out trolleys and headed over to the info centre to waste more time. 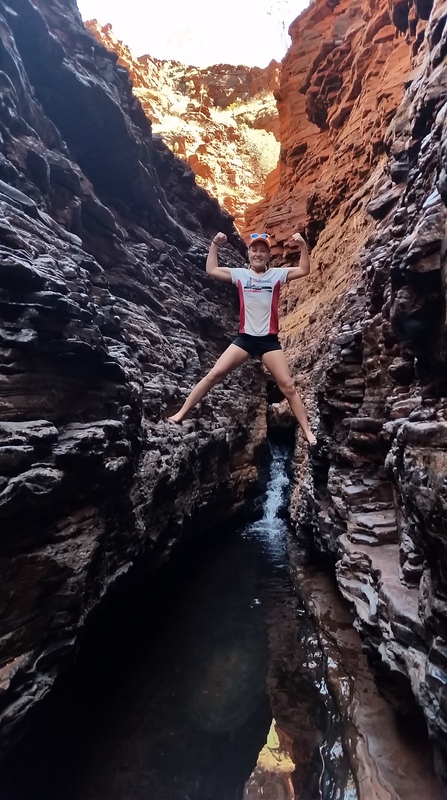 As we had planned to travel to our next destination on private Rio Tinto roads, Fiona and I needed to watch a short documentary to obtain a permit. Twenty minutes later, with said permits in hand we headed back to Coles to continue our shopping. 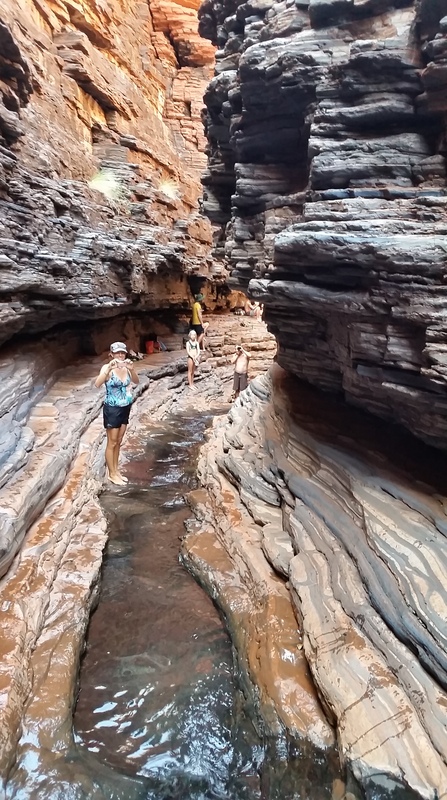 Our last destination in Karijini was to Hamersley Gorge, on the north west side of the national park. We had decided to call in here on our way to our next campsite, as it was only a stones throw from the private Rio Tinto Rd. 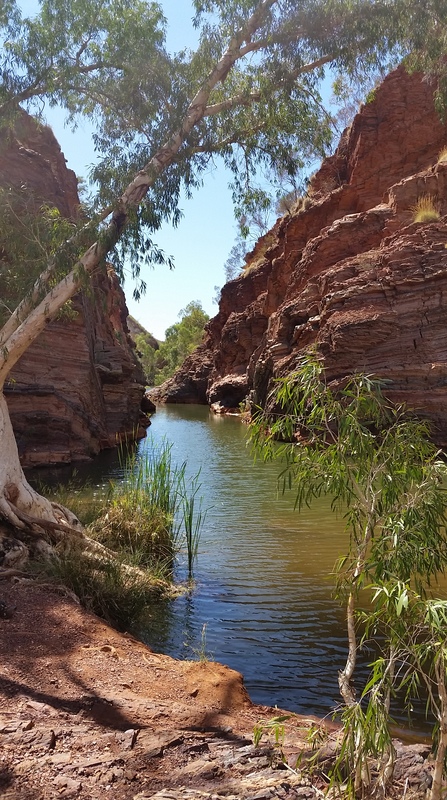 So after we made ourselves some lunch we spent the next hour cooling down in the water and swimming along the gorge to explore a little. 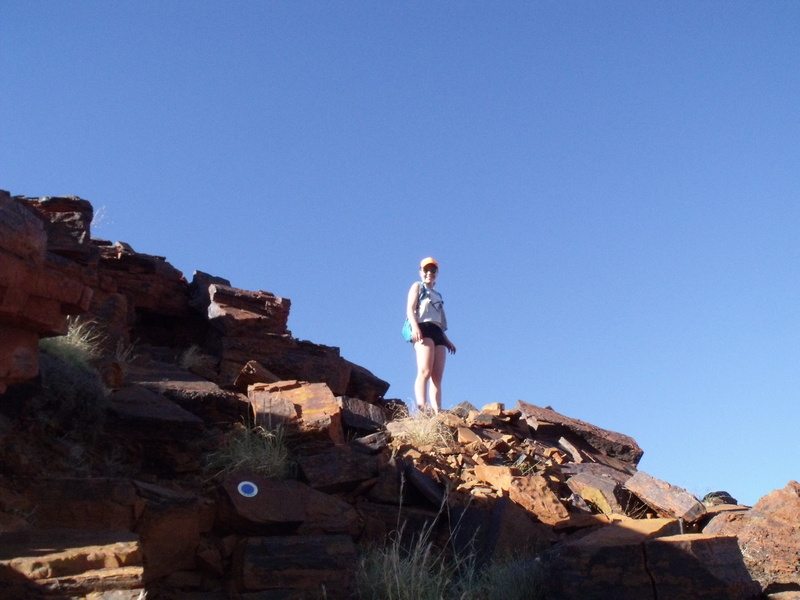 The rocks here were amazing, the way the different layers of iron and silica travel up and down along the cliff edge, you can only imagine the movement and the force of the earth so many millions of years ago. 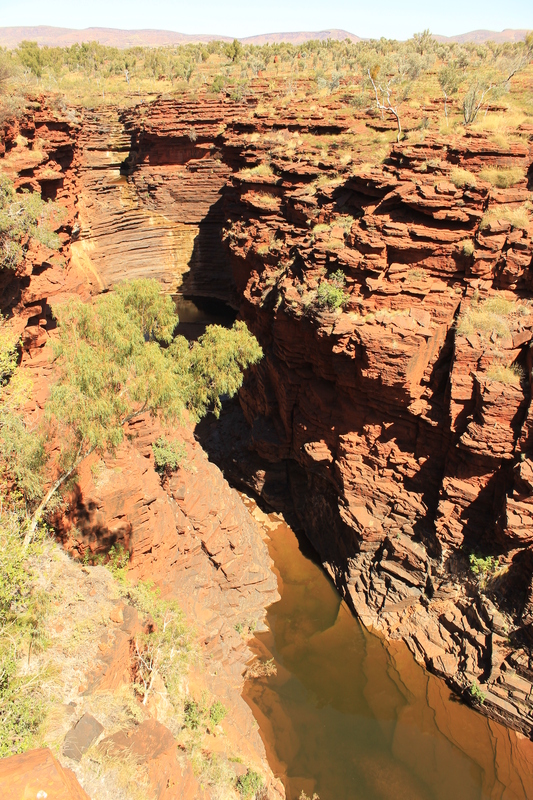 Hamersley Gorge from the lookout. 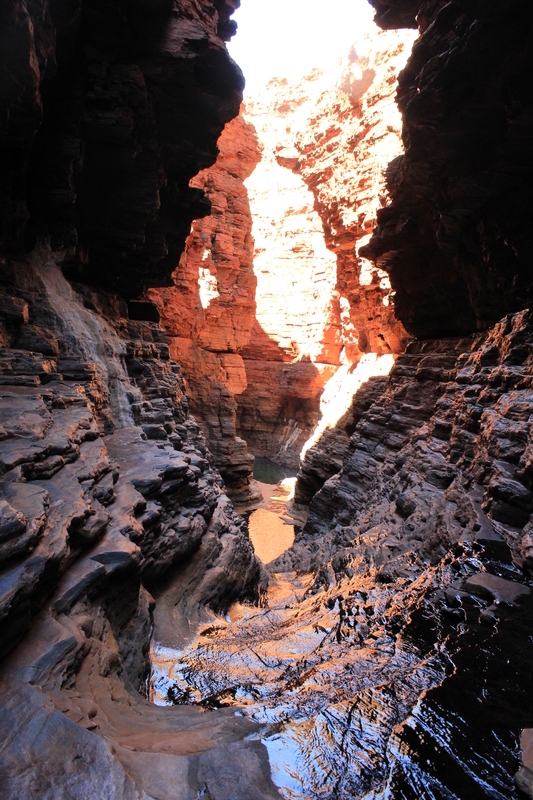 The amazing rock cliffs of Hamersley. 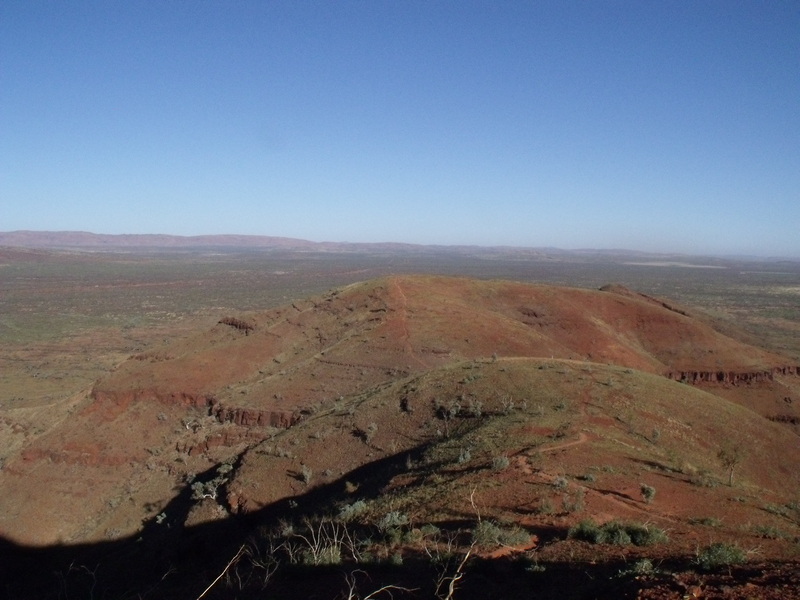 Love the red cliffs against the white Sappy gums. 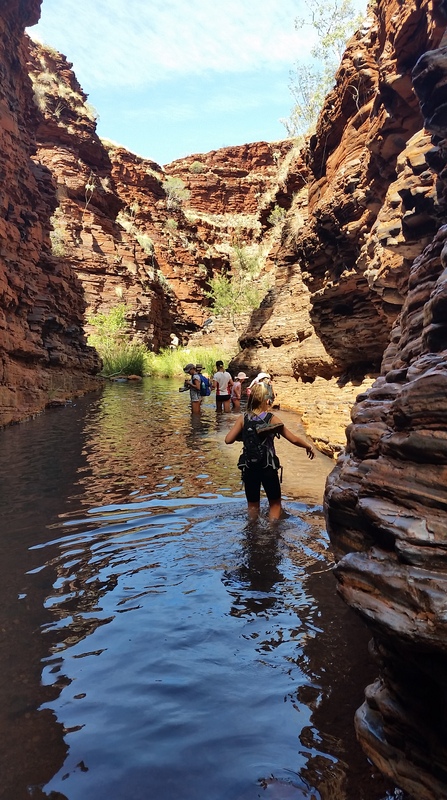 As our stay also coincided with the “Karijini Experience’, we were lucky enough to participate in many of the free events that they organised. The kids had fun making spears and also attended a musical workshop, which they enjoyed thoroughly. 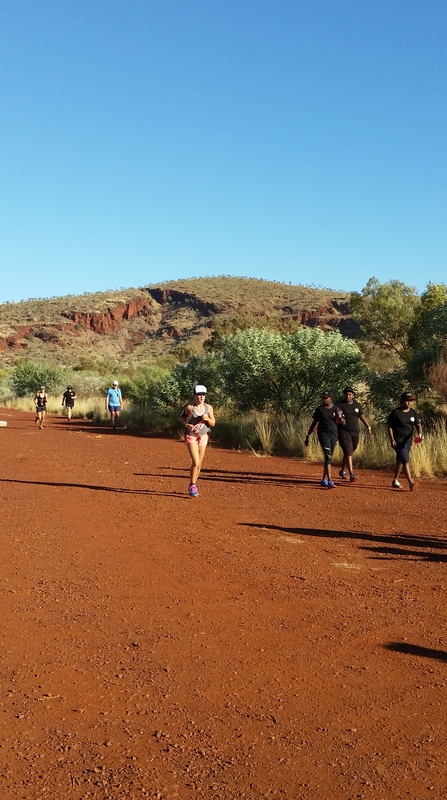 We all also participated in the Deadly Fun Run, which was run on the air strip near the info centre. 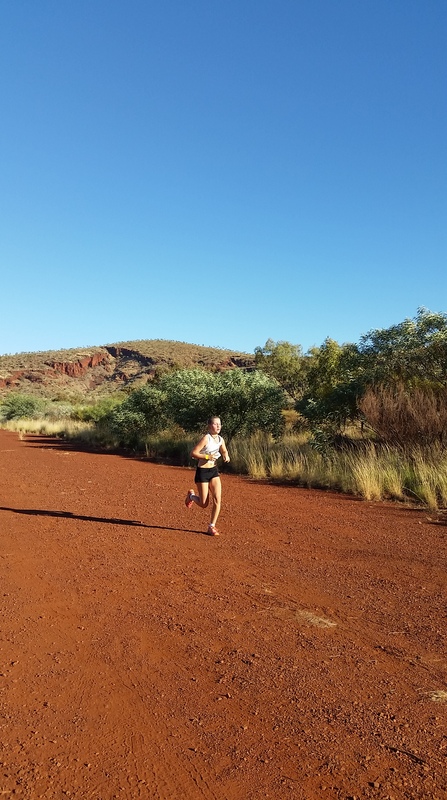 It was a 2km or 4km run/walk, with Jess, Abs and I running the 2km and Nik, the older 2 Smith girls and Fiona and Chloe Mol completing the 4km run. They all did an amazing job, with Bec and Abby being the first girls across the line in their respective distances. 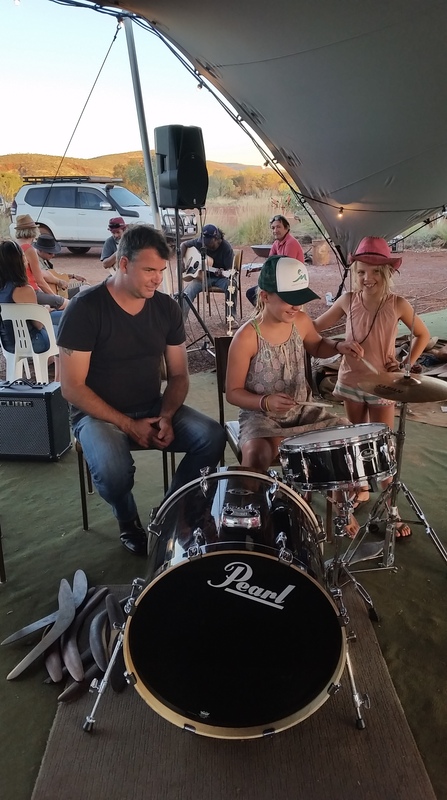 The “Karijini Experience’ week concluded with the Moonrise Makers Market, where Nik and I purchased our first Indigenous canvas painting, now all we need is a spare piece of wall to hang it on……. Zoe at the musical workshop. Bec crossing the line as the first female!! Zoe finishing the fun run. 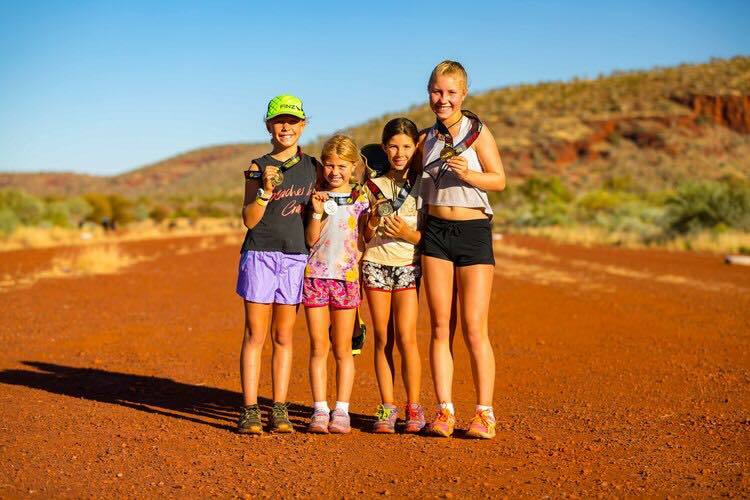 Abs, Jess, Chloe and Bec with their Deadly Fun Run medals. 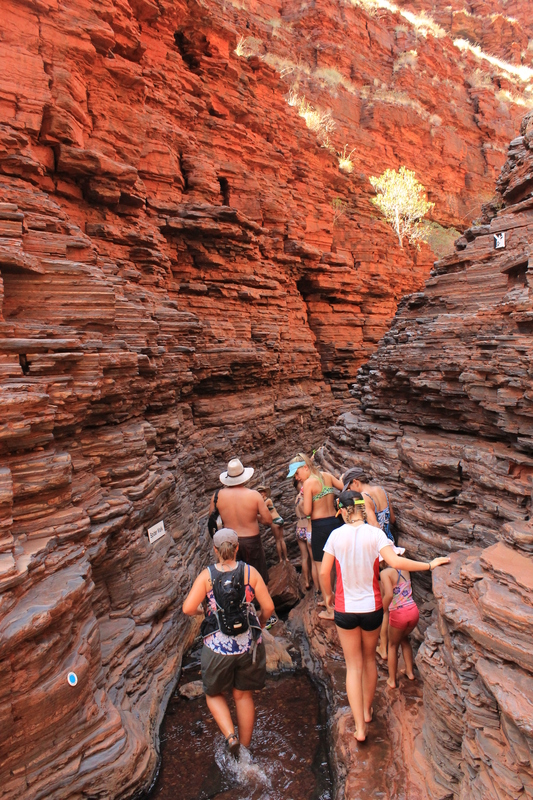 Karijini National Park certainly didn’t disappoint us, we were in awe of the natural beauty and ruggedness of this place. Northern WA itself is an amazingly spectacular area and every place we visit, it seems to be upping the ante more and more. 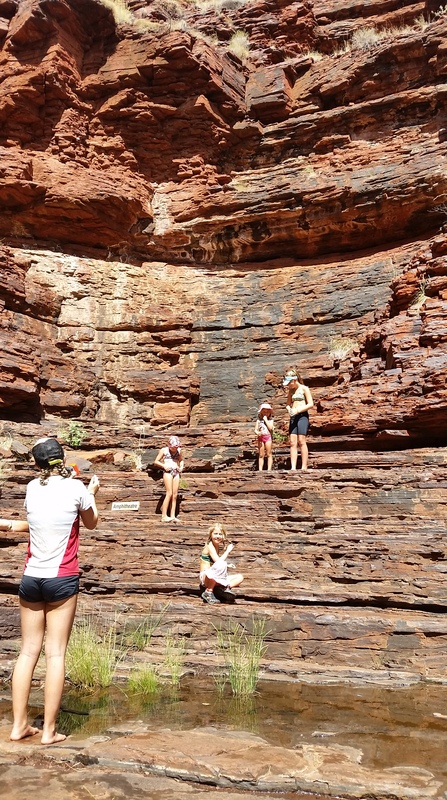 Bec has already stated she is coming back, particulary to do one of the canyon tours. 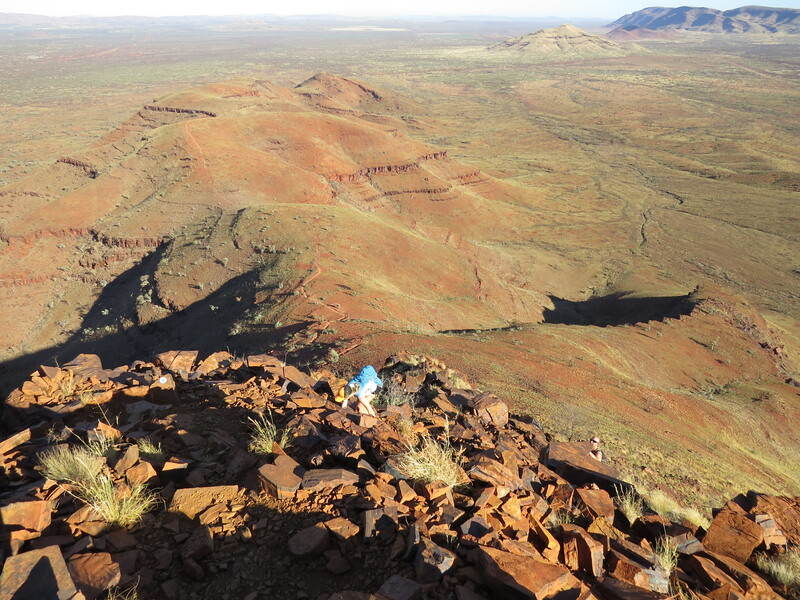 The Pilbara is certainly a place of contrasts, with natural wonders and mining occuring side by side, we were lucky enough to experience its beauty at present and just hope that it stays this way for many generations to come…..
Next Next post: Millstream- Chichester National Park, Western Australia. Have been thoroughly enjoying your posts. 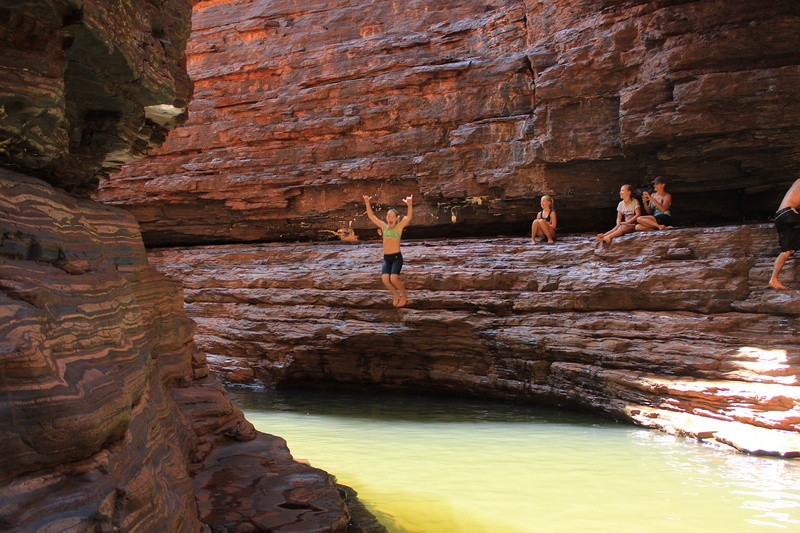 Not many people get to experience how wonderful Australia is outside of the main cities. The fact that your children are having this experience also makes it extra special. 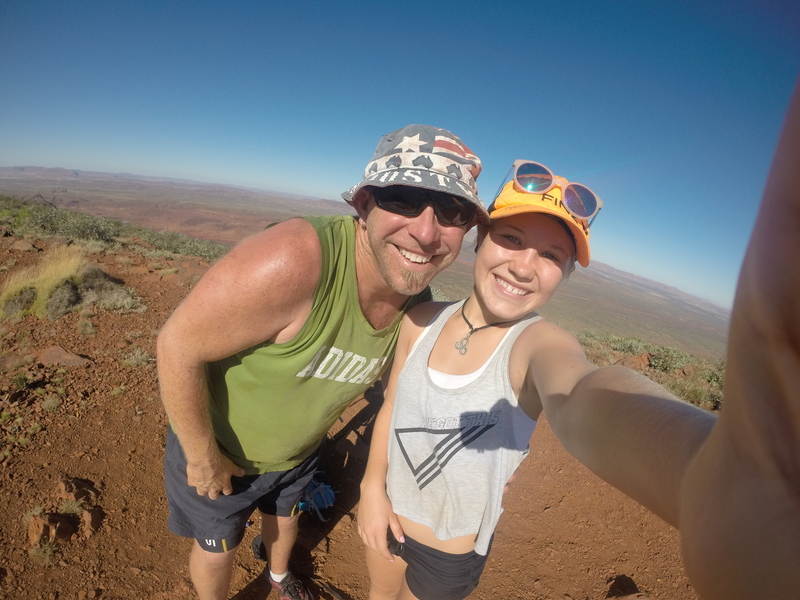 Loving all of your great photos and details on each place. Many thanks and safe travels. Looks amazing, I can’t wait to get up there.